For centuries, traders along the Silk Road relied on the oasis at Dunhuang for a reprieve from the withering sunlight and heat of the Gobi desert. By 2011, a large solar farm on the outskirts of the city had started transforming that searing light into an energy resource for the region. 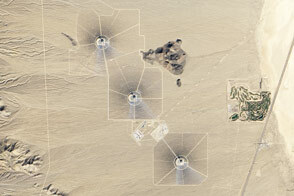 The Advanced Land Imager (ALI) on the Earth-Observing-1 (EO-1) satellite captured this series of images showing the installation of solar power panels on the outskirts of Dunhuang in the Gansu province of western China. 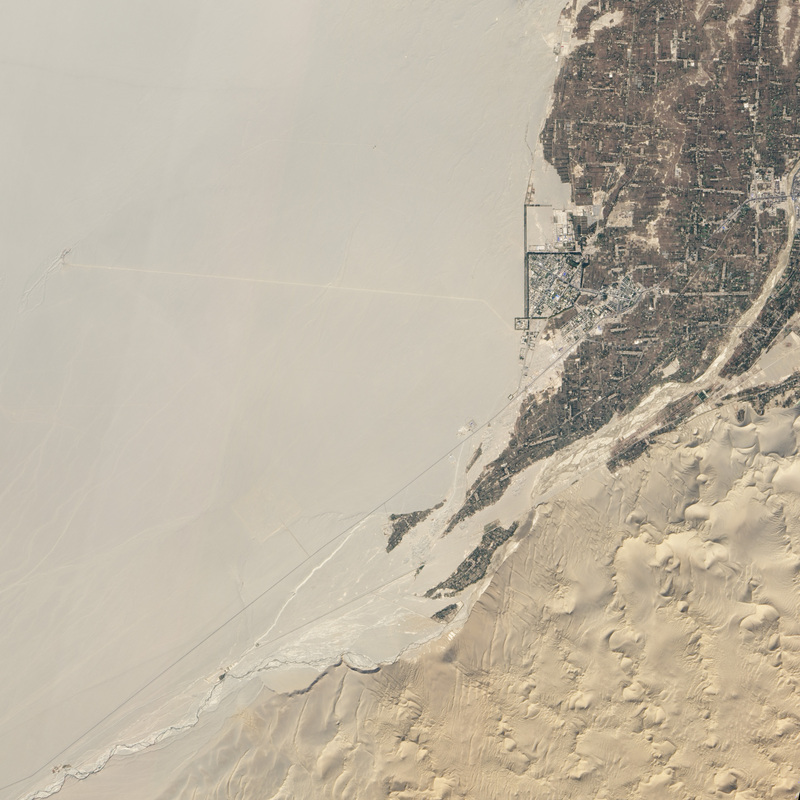 In 2006 (top image), barren desert dominated, except for the road and a few patches of agricultural fields (lower right). 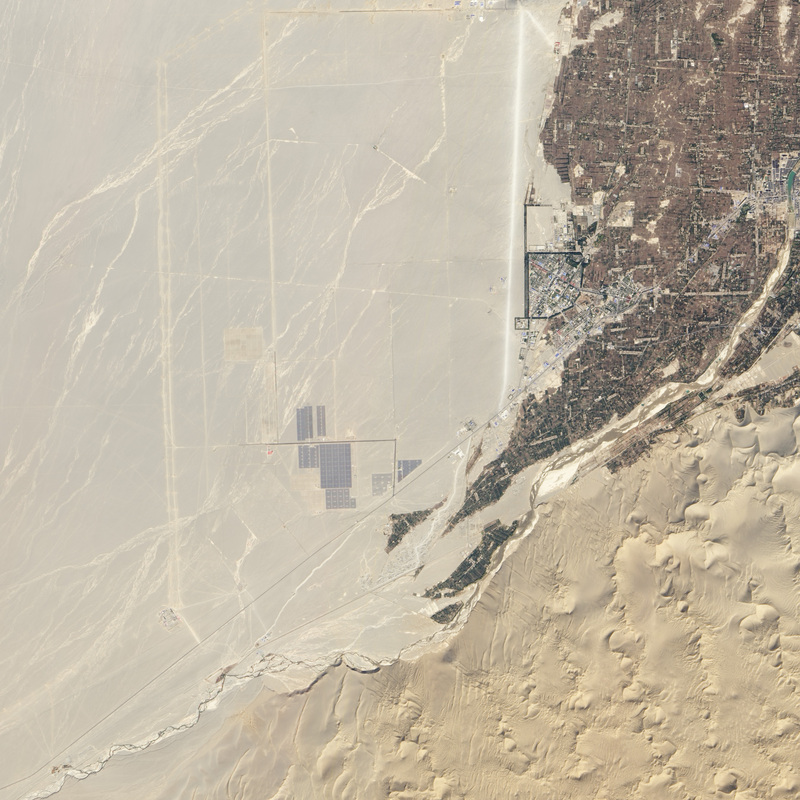 By 2011 (middle image), grids of photovoltaic panels began to appear in large numbers. 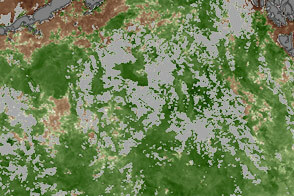 By 2012 (lower image), thousands of square meters were covered. China’s State Development & Investment Corporation and the China Guangdong Nuclear Power Corporation (CGNPC) began construction in the area in August 2009, according to China Daily. Two 10-megawatt (.01 gigawatt) facilities were opened by July 2010, making the site China's first large-scale solar power station. 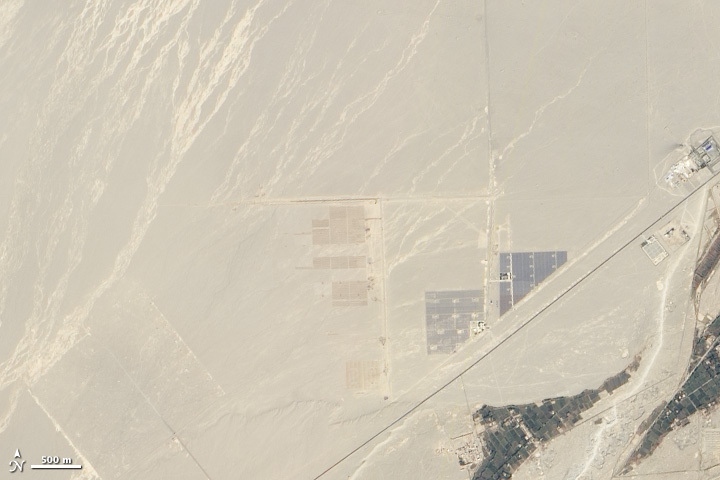 Chinese authorities hope to expand the electricity-generating capacity of Dunhuang’s solar farms in the future. The State Council (China’s equivalent of the cabinet) set a goal of increasing Dunhuang’s solar power generating capacity to 1 gigawatt by 2020. For context, China’s total installed solar capacity at the end of 2011 was about 3.1 gigawatts; the United States had 4.4 gigawatts of capacity by the same date. 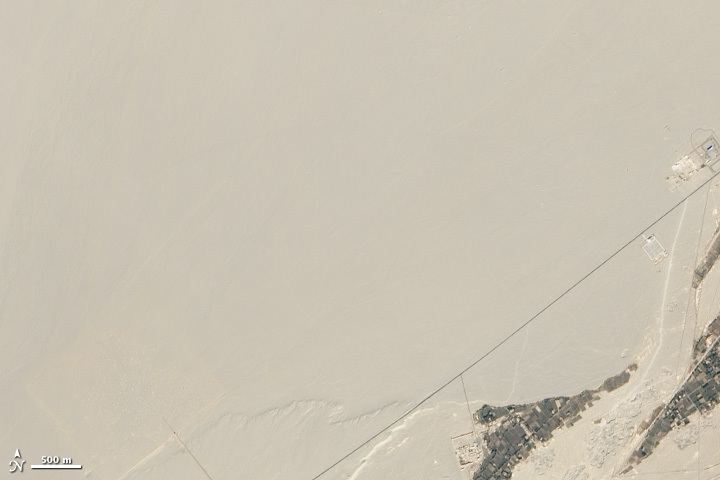 However, Dunhuang’s solar plants will have to contend with powerful dust storms that often hit the area in the spring. Also, the shortage of water in the region will make it challenging to keep the solar panels clean. 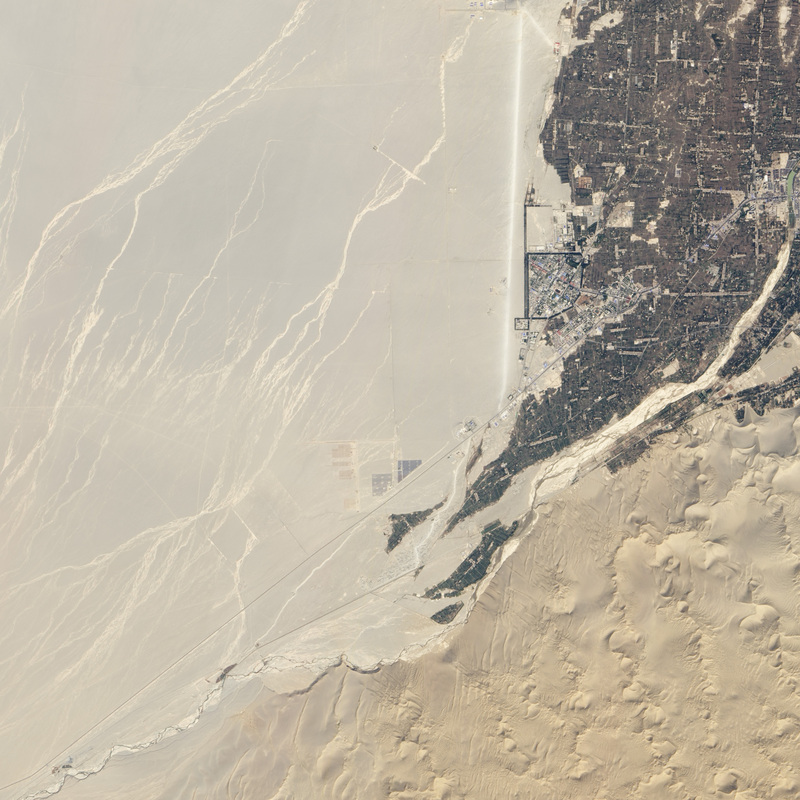 After a visit to one of Dunhuang’s solar plants in 2012, Nanyang Technological University engineer Nilesh Jadhav estimated that dirty panels could decrease the efficiency of Dunhuang’s solar panels by 15 to 20 percent. 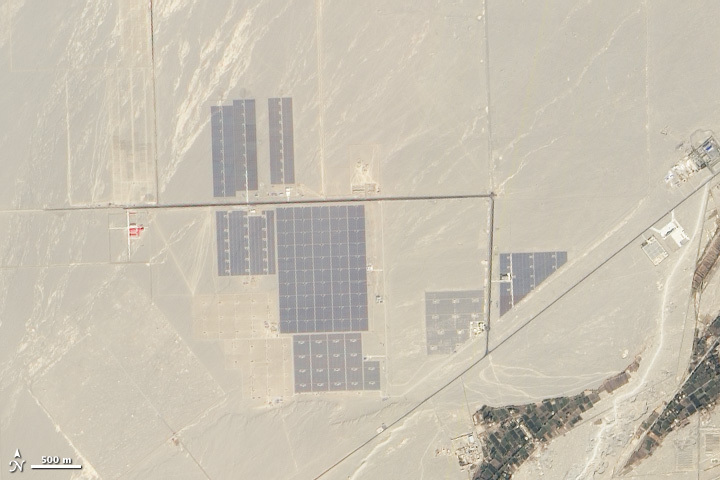 An oasis along the ancient Silk Road has become a hub of solar power production in China. 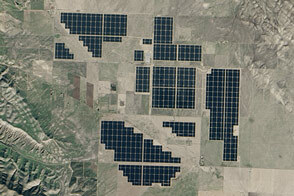 These images show the expansion of solar power facilities between 2006 and 2012. 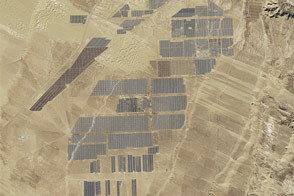 China Daily (2010, July 5) Dunhuang solar PV plants to be finished in July. Accessed Jan. 30, 2013. 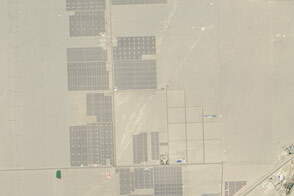 New York Times (2009, July 2) Green Power Takes Root in the Chinese Desert. Accessed Jan. 30, 2013. 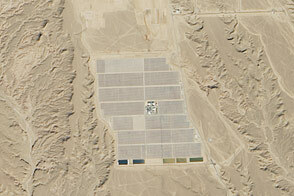 Solarika (2012, April 29) Dunhuang Solar Power Plant. 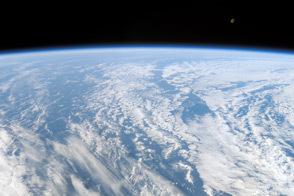 Accessed Jan. 30, 2013.